Feeling the burn? Don't let a little sunshine put a damper on your vacation. Stock up on all natural & organic products specifically made to keep your skin happy while enjoy some extra rays. Whether you are beach-bound, seeking cooler temps in high altitudes, or spending more time pool-side, you will want to add these products to your daily beauty routine to keep your skin happy and healthy. Apply Hydrating Solar Protect early and often as your daily moisturizer and sun protection. Nourishing and organic key ingredients Shea, Aloe Vera, Red Raspberry Seed Oil, Coconut Oil, and Sage combine for a solution that is light and nourishing. This daily SPF creates a protective barrier between your skin and harmful UV rays. Tip from the maker: Mix with your foundation for a natural, soft glow. Sun burns happen. This is where Sun Worshipper comes in! "This serum is specially formulated for sun lovers and worshipers, repairing sun damage, brightening dark spots, clearing acne, soothing sun burns, healing wounds, and improving over-all skin health and tone." After a recent trip to sunny San Diego, I applied this serum 2-3x a day where I noticed I had sunburn and redness. The affected areas healed rapidly, and that dreaded itching, burning, and peeling all remained at bay! A heal-all for sunburn, sun damage, repelling insects, soothing sensitive skin and reducing redness. 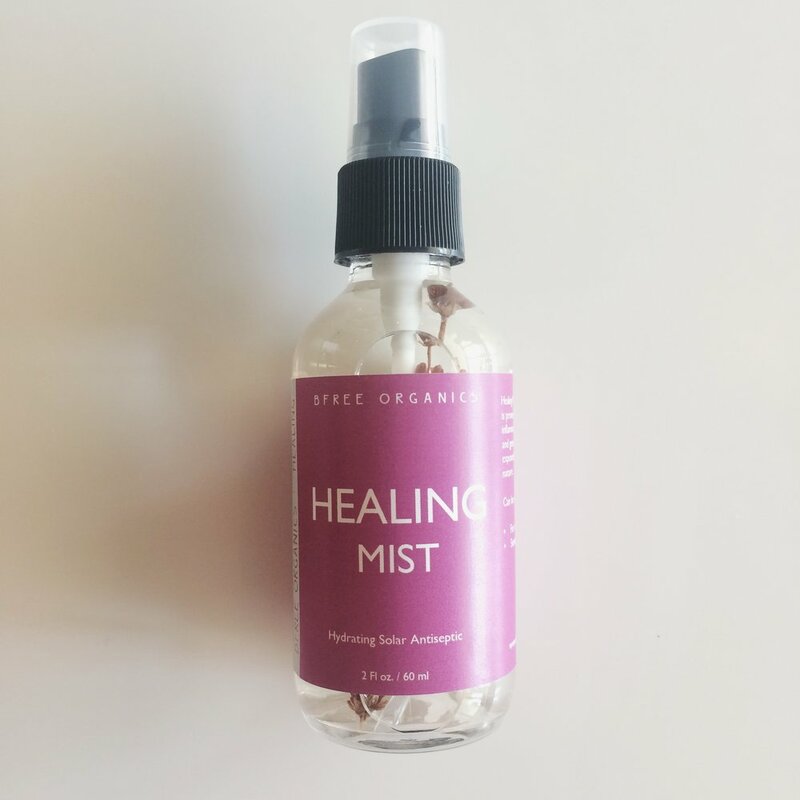 Healing Mist comes in handy especially when you have the can't-seem-to-cool down feeling that you just can't shake! Bunky Tip: Keep this in the fridge and spray lightly on the face for extra refreshing relief. Pretty, girly, and a little lacey; we just love our line of top and dress extenders from Grace and Lace! Instantly elevate your spring & summer outfits by incorporating lightweight and eye-catching layers. These pieces are incredibly soft tanks and camisoles in neutral hues with a pretty lace trim that peeks out from underneath a blouse, "extending" it! These are perfect for adding a little length to a blouse, transforming your favorite tunic into a dress, or simply lending texture and layers to an outfit. We layered the Chiffon Hi-Lo Extender (dress length) underneath the Victoria Tunic for an easy dress look. This extender is great for those slightly-too-short dresses, and we love the feminine, cascading ruffles. Adjustable straps ensure a length that is juuuust right! Our Dress Extender comes in black, too! 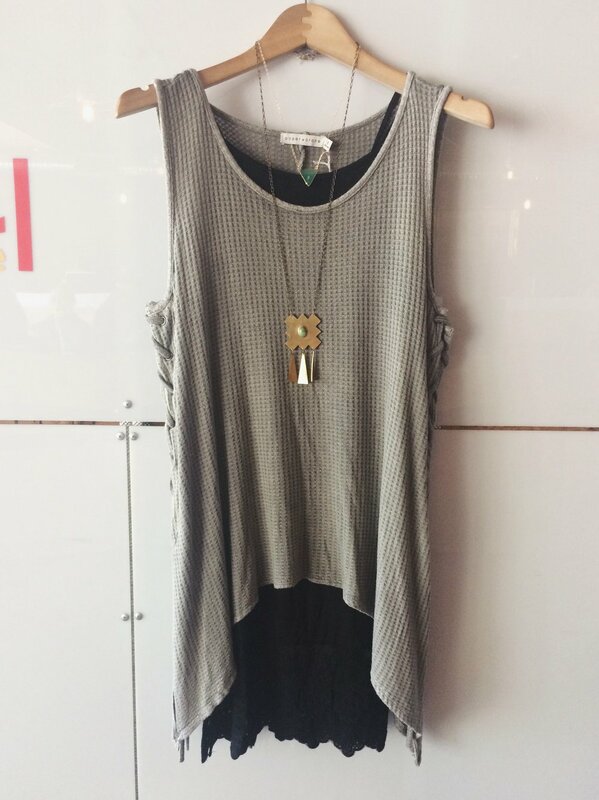 Layered underneath the Grey Waters Tunic, you can wear this look as a dress or over skinnies. You may have noticed our new skincare line for women in store or while browsing bunkyboutique.com. Maybe you have picked up a few products to try out, or have already gotten hooked on one of the amazing masks or sun serum. We chatted with Leyna of Urb Apothecary and received some great tips on adopting a skincare routine of your own to get the most out of your products and maximize their nourishing benefits! Leyna says: "The Charcoal Mask I would do once a week, or once every two weeks. [Use] the Cacao Mousse Mask once -twice a week"
Renew and rejuvenate your skin with Cactus Face Polish. This amazing scrub doesn't harm skin with harsh edges like some exfoliates, but rather encourages blood flow and new cell growth! Leyna says: "Use no more than twice a week." We have always known Matcha tea is delicious- but the Matcha Sugar Scrub takes our cravings to a new level! Sweet + earthy, we love this gentle body exfoliate and how it leaves our skin soft and reduces redness and bumps (especially during these high-allergen months!). Leyna says: "... Scrub into your body 2-3 times per week. If you are doing one or more of [the above] , spread them out so you are not doing two masks in one week." We currently offer two of Urb Apothecary's facial serums, Green Tea and Sun Worshipper. Green Tea Serum: rich in anti-oxidants, essential fatty-acids and healing herbal infused oils that help protect skin from the sun, slow signs of aging, balance sebum production, and minimize pores and wrinkles. Sun Worshipper: specially formulated for sun lovers and worshipers, repairing sun damage, brightening dark spots, clearing acne, soothing sun burns, healing wounds, and improving over-all skin health and tone. Leyna says: "I alternate the Serums! But right now the sun worshiper is my jam." As we enter beautiful wedding season here in the desert, you may be on the hunt for unique gifts and adornments for your own big day, and for the people helping you along the way. Find beautiful bridesmaid gifts, a thoughtful groomsmen 'thank-you,' surprises for your maid of honor, centerpiece inspiration, the perfect card, and a little beauty for the mother of the bride. Shop small for your big day! For a pretty and interactive centerpiece, choose a desert-inspired piece that a lucky guest gets to take home! Locally made puzzle perfect for your coffee table or guest suite. Locally made with a touch of shimmer. 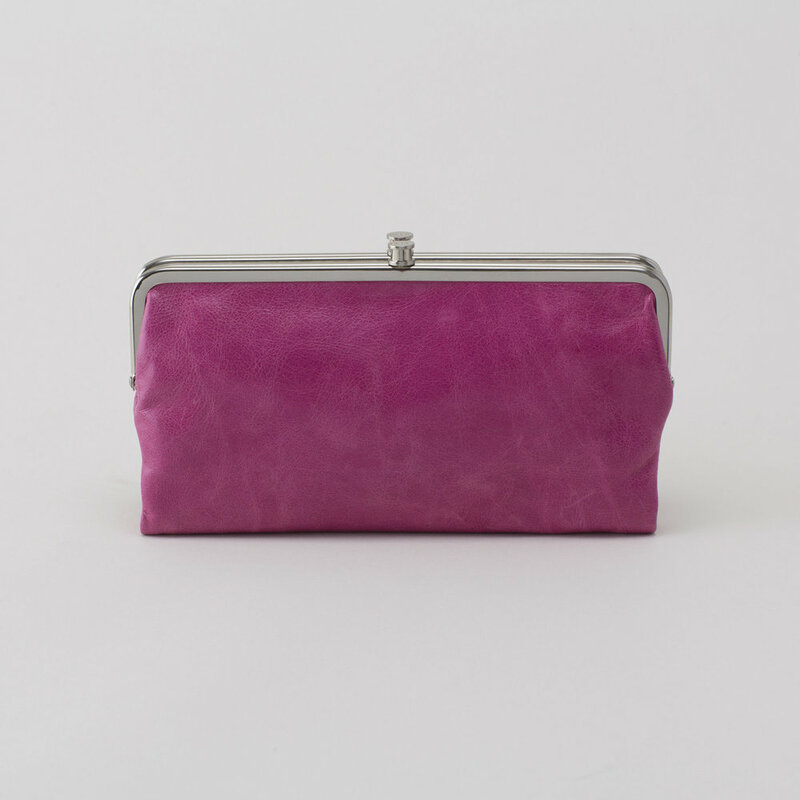 Available in store, or email info@bunkyboutique.com to order. Precious Gemstone Necklace ($48) choose from a variety of stones such as Black Diamond Swarovski, Montana Blue Swarovski, and Aquamarine on either sterling silver or gold fill. Your bridesmaids will smile every time they share a business card or purchase their morning coffee from these adorable, hand-stitched leather card holders. Available in shimmering foil finishes or pony. 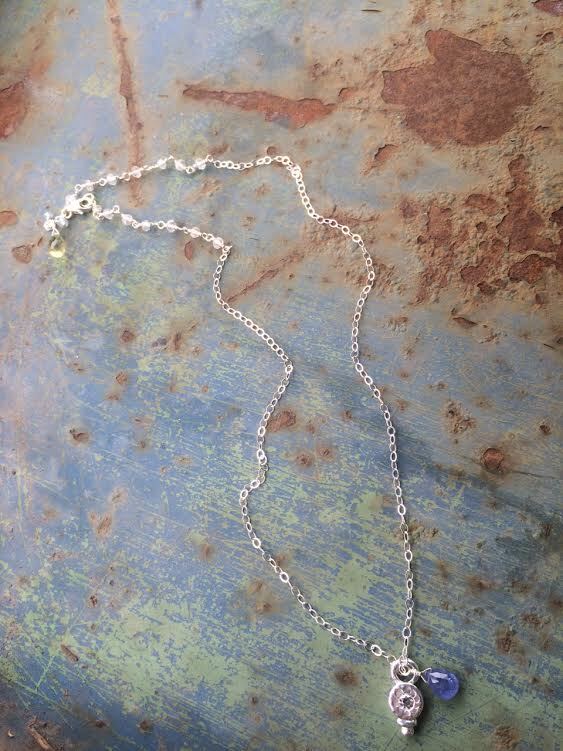 Stardust Wish Necklace ($48) dainty and feminine single stardust bead necklaces in a variety of style combinations. Mix and match gold fill, rose gold fill, and sterling silver beads and chain. 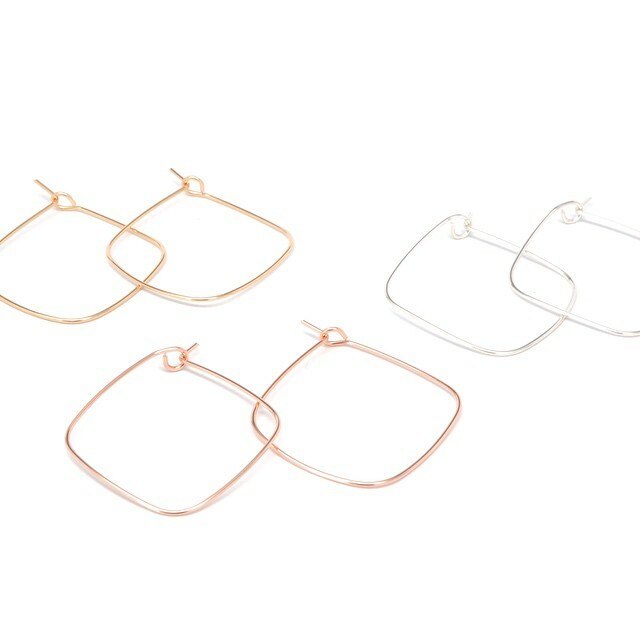 Choose from gold fill, rose gold, or sterling silver. Handmade and perfectly unique money clips featuring saguaro cutouts and the state of Arizona. Custom pieces available! Email info@bunkyboutique.com to order. Locally made, engraved minimalist card holders wallets made of pure titanium with a handy bottle opener. Outfit your groomsmen in these handsome wooden cuff links featuring either saguaro cactus or the state of AZ. Share the Arizona Love with matching tees featuring our exclusive Arizona Love design! These make a great wedding gift or fun gift to one another. One of a kind stunners, just like her! Shop a variety of one-of-a-kind necklaces, earrings, and bracelets made with love here in Arizona. Each piece is composed of gold fill or sterling silver, gem-grade stones and awe-inspiring details. Find the perfect piece or have a custom item designed. Email info@bunkyboutique for more info. Show your love and appreciation with one of our artisan-made Malas, pendant necklaces or gem-filled drop earrings. 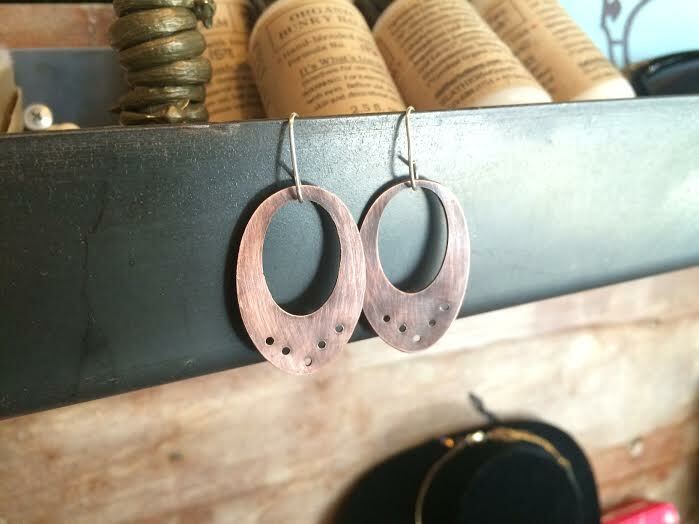 Handmade with love and care in Phoenix and sure to be a treasured addition to her jewelry collection. Leap into Festival Season is happening at Bunky Boutique February 27th, 28th and 29th! Join us in store and shop the best apparel, jewelry and accessories of the season and enter to win a pair of McDowell Mountain Music Festival passes! The Freebird Tee is a music festival must-have! Incredibly light and soft, this is the PERFECT t-shirt! Layer on pendants like the Druzy Arrow necklace. A light and sporty bralette completes your look while maintaining comfort (which is SO important when you are going to be out all day and night). Protect from those sunny UV rays with a killer pair of sunglasses and organic skincare from BFree Organics. Lightweight enough to throw over a cami or tie around your waist, the Drifter Raglan Pullover will be just the right piece to throw on once the sun sets and the festival grounds cool down. Lay it on the grass during the day for an instant barrier from the grass. No toting around a bulky towel required! The basics. Build your festival outfit around these pieces perfect for mixing and matching. Start with a great cami and show-stopping bralette. Layer on the accessories and throw on your shades! Cargos are your warm weather secret weapon; functionality of denim and the comfort of linen. We are loving the new Dayla Cargo Pant by Level 99. Pair it with the super sweet Morning Smile Tank for a look that is laidback and effortlessly cool. Get New Year's ready with our shopping guide sure to make your outfit deciding a piece of cake! Start out with the perfect dress, then layer on all the glittering, shimmering goodness you can handle! Cheers! Bunky Boutique will be open New Year's Eve from 10AM-5PM and CLOSED NEW YEARS DAY. We will reopen January 2nd regular hours 10-6! The calendar says we have officially dumped summer and began our annual mingle with fall. Though for most of us in the southwest this means sipping our seasonal lattes in the comfort of our A/C and longingly staring at our fall wardrobe. We take fall pretty seriously here at Bunky. Give us all the festive candles, cozy cardigans and chai lattes! That's why we like to ease into fall with light layers and pretty gem tone shades. Fall style, southwest edition! When it comes to layering, a piece that is versatile, light, and easy to store away is a must! It's never fun when your outfit depends on an outer layer and you suddenly find yourself burning up (wearing just a showy cami under your blazer- oops!). We like this Stripes Henley, Toggle Cardigan and sleeveless Oversized Slub Knit Cardi. Open back is always a good idea! The Chaser Shirttail Dress in dreamy "chambord" is the perfect dress for the season. Lightweight with an open back keeps things easy, and lets you show off your cute strappy bralette! Another Bunky fave is the Chaser Open Back Raw Edge Tank. Classic graphic tees and a great bag never go out of style! Swap out your summer maxi skirts and denim cutoffs for a flirty skirt or these amazing suede shorts. That way you can keep it cool and still rock your booties and socks you've been dying to bust out! Finish it all off with a unique necklace for that extra dose of ooooomph. How do you style your fall fashion? Gotta gift a man in your life? We have an assortment of awesome gift ideas to fit the occasion! Whether it's your S/O, dad, father-in-law, graduating cousin or your helpful neighbor, you can't go wrong with a classic hat. Is he a a dapper dude? Check out our premium collection of Baxter of California and Buckler's grooming products. One of our go-to giftables is locally made John's Tonic Syrup. All natural ingredients make for the perfect, not-too-sweet gin & tonic. Shop men's essentials here. In store you will find an assortment of locally made candles and room scents to put together a unique housewarming gift! Better Together: the Splendid matching Relaxed Pant and Scoop Tee. Our obsession: the Splendid matching Relaxed Pant and Scoop Tee. Pair with a solid color handbag and strappy heels or gladiator sandals! Shown here: Do it All Crossbody, Piper Crossbody, Amethyst Mala. Take 'em solo: Versatile pieces alone, these Splendid singulars work wonders with items you already have in your closet! 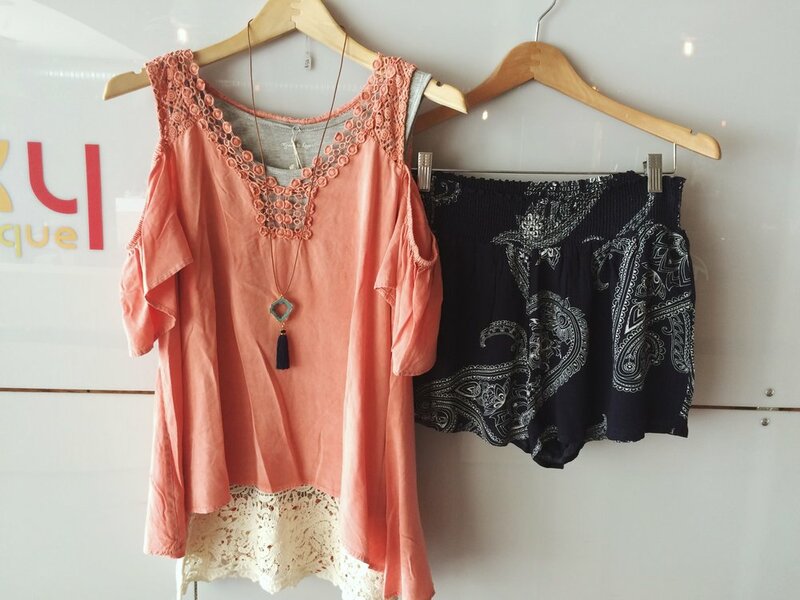 Pair the Scoop Tee with a stylish mini, boyfriend denim, or go bold with a pattern mashup such as these lacey shorts! Keep things tame with a simple bag and gold-toned jewelry. The Relaxed Pant can go edgy, laid back, or dressy. Here we paired the pant with the Chaser Skull Tee and Splendid Seamed Tank. Structured tops or a tucked-in button down would take this look to a new level! This cocktail is refreshing, light and just waiting for a summer barbecue!